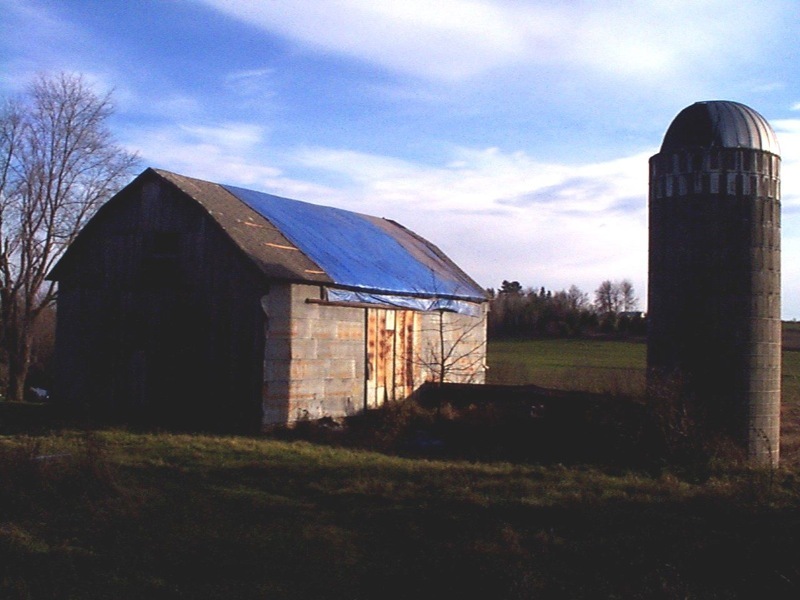 In 2004 - ten years after the farm was retired - we began to seriously explore our options for saving the roof, and consequently the barn. We contacted roofing companies and asked for bids. This was the middle of a nice building boom in the area housing market and there weren't many companies (or individuals) willing to even do barn roofs. Although they are simple to do - no valley's or different levels to deal with - they are high and dangerous. 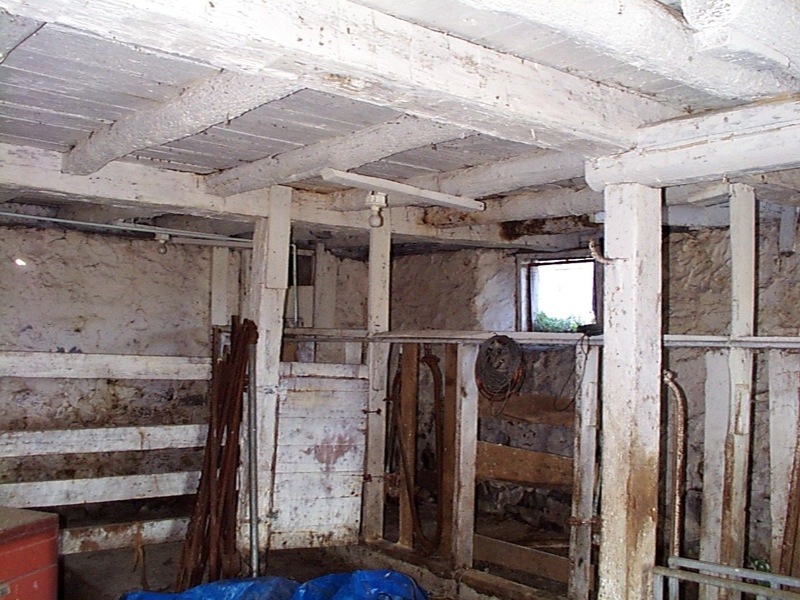 The estimates we received were way more than we could either afford or justify by the return we would get in either use or rental of this barn. So we put on a large tarp in an attempt to delay a decision (perhaps until the building boom slackened a bit). We happened to have this tarp and it seemed like a good idea at the time. The tarp didn't last through the winter. South view of barn and yard. 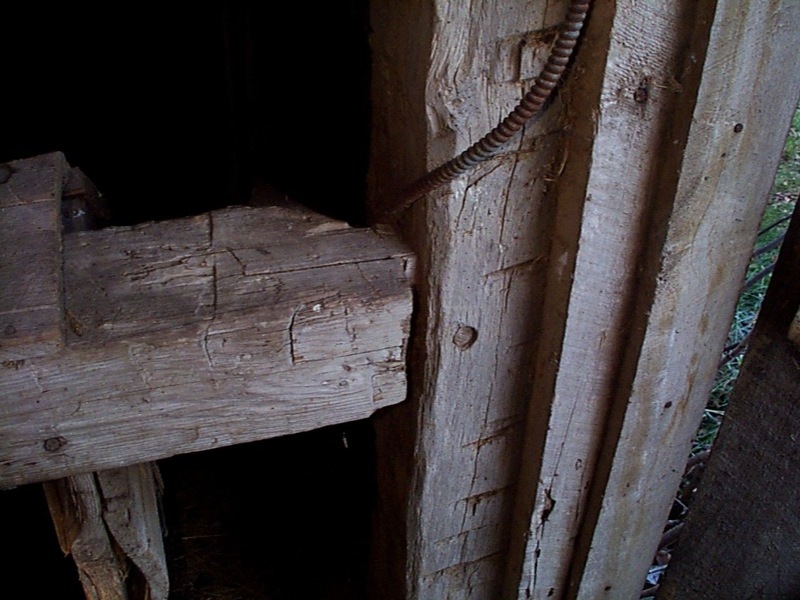 The smaller of the two silos had already been removed by 2004 - while under previous management - leaving a gaping hole in the roof of the silo room. ... but not it's appeal (click on pictures for larger view). 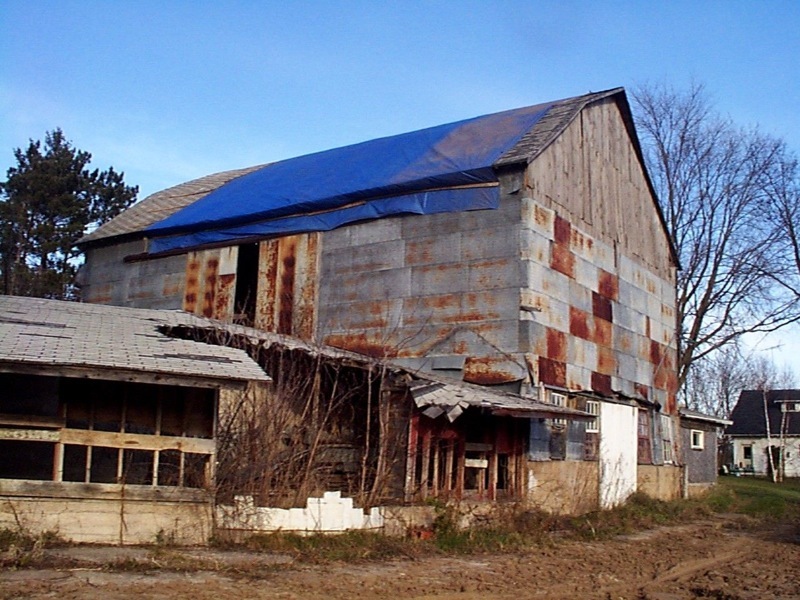 The construction of these old barns is something to be admired and preserved. 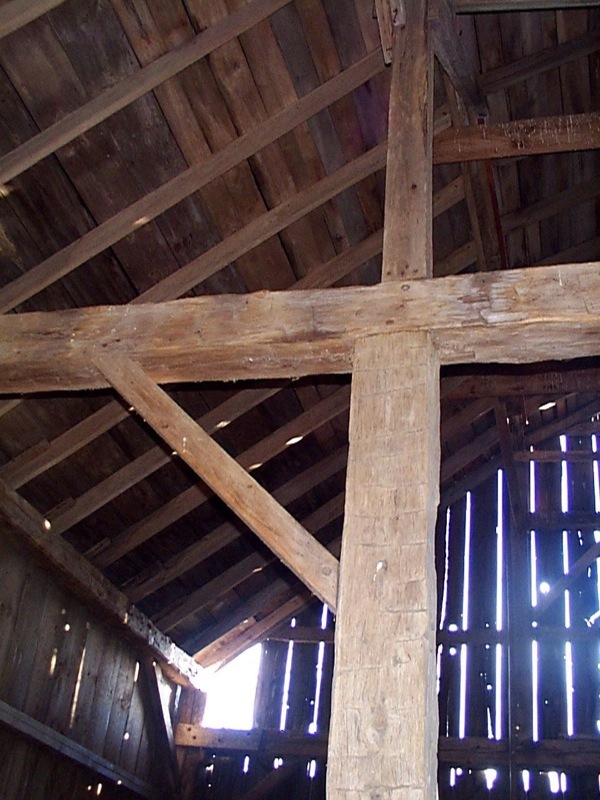 Heavy hand hewn beams and wood-pegged mortise and tenon joints throughout the upper barn. The lower barn has rough half logs as floor joists and more hand hewn beams for the main support. The rafters are notched into the support beams. 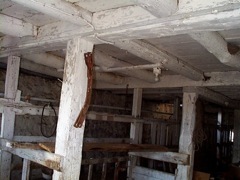 Wood pegs holding all the joints in upper barn. Another picture of a hand-hewn 12X12 supporting beam with a smaller cross beam attached using a wood pegged mortise and tenon joint. 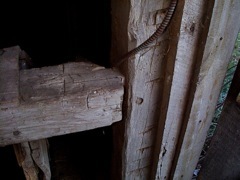 These joints would prove to be the reason for the difficulty I had in pulling down this barn. 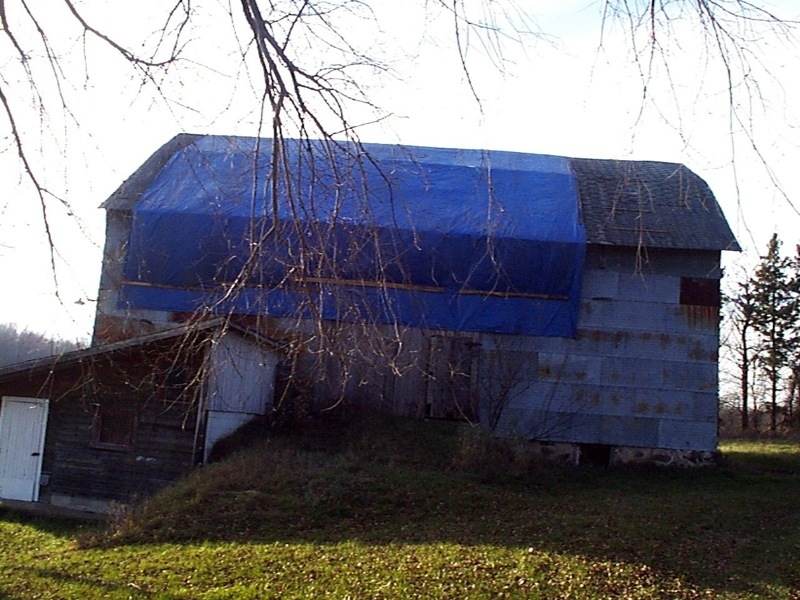 They are also the reason that most of this barn remained standing through the F3 tornado that pulled off it's roof in 1052 [link to more info on this tornado]. 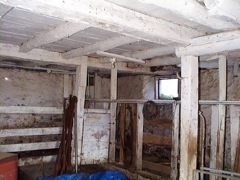 Slide show: Images of the barn just before we started deconstruction. Some to remind us why it has/had to come down. As you see there were places where it was already starting to FALL down on it's own. 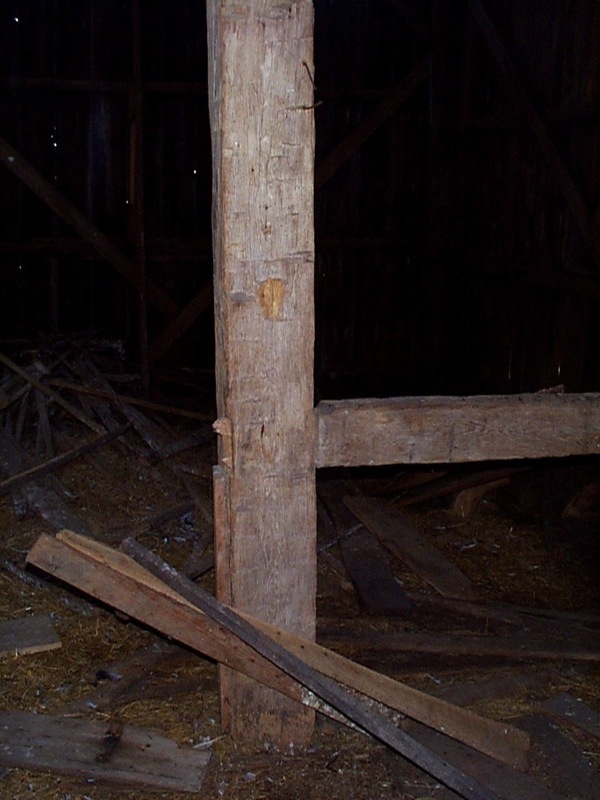 I realized that if I wanted to save any of the great beams and boards that were used in building this barn, I would have to act fast to get them taken down and moved under cover. 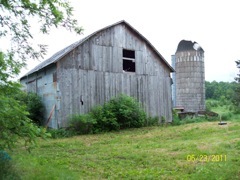 Obviously this picture was taken in the late summer because of the tasseling corn in the bottom field (to the left) and the straw in front of the barn to the right. There was a straw pile against the north end of the barn from a recent thrashing party. [click on this picture to enlarge] One thing I notice is that the barn must have been painted white at one time (white washed?) There has been no sigh of that on any of the tin siding I have removed. My dad is standing in front of our John Deere model MT tractor. For most of the years that I was growing up this was the only tractor we had and it did all the machine work on the farm. It was less powerful than most modern garden tractors. My Dad with some free time. Here's another picture from the same time as above. 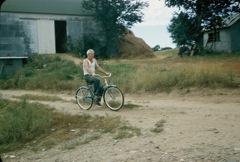 At the time I was only 4 or 5 and I never remember my dad riding a bike (or having time to do much of anything besides working, eating, and sleeping). This picture shows the straw pile on the north end of the barn where it was deposited by the threshing machine. One of our neighbors owned a threshing machine (separator) and he would take it around to all the farms - in turn - to thresh the oat crops (separate the oats from the straw). All the farmers would team together and would bring their tractors and wagons and help pick up the bundles of oats and deliver them to the machine where they were separated from the straw. The host farm would always provide the noon meal for all the workers. These were truly memorable occasions and probably the best meals we ate all year. I loved these thrashing parties because I was too young to do the heavy lifting but not too young to drive tractor. This gave me a chance to drive all the different kinds of tractors that the farmers would bring to the party. Cool. This picture doesn't have anything to do with the barn but I'm including it because I think it's a great picture - even with the blur. This is a bit earlier than the above picture because the tractor is a John Deere B that we had before the MT pictured above. 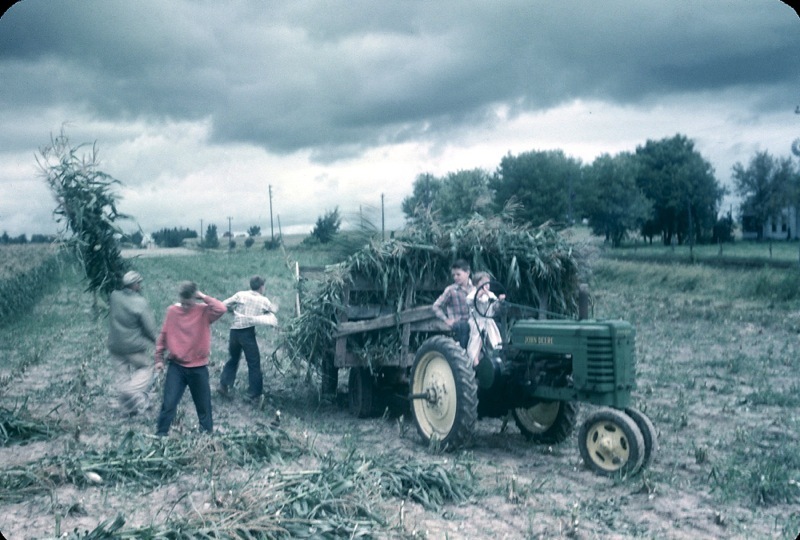 I'm not sure but I think the guys loading the wagon are my brother Dan, my brother Roland, and my father - who is carrying the bundle of corn (shock). Notice that my father is using a pitch fork and my brothers are not. I am told that the fork required a great deal of strength and coordination to manage these heavy shocks. But it made the work go much faster. My brothers aparently hadn't mastered that skill at this point and were picking up and loading the bundles by hand. I know that one of my brothers (Jim) is driving the tractor and I think that is my next oldest sister (Win) on his lap and steering the tractor. I would have been too young to be involved with this operation. Maybe I was with whoever was taking the picture (probably Uncle Dan). If that is my sister Lorna steering the tractor then I may not even be born yet at the time of this picture. This is how we put corn in the silo back then. First a machine, called a corn binder, was pulled down the corn row. It cut the stalks off above the ground, bundled them, and then dropped them onto the ground. The next step -- shown in the picture -- is loading these bundles onto the wagon and hauling them down to the silo where there was a machine that chopped the stalks and blew the silage up a pipe into the top of the silo (all in one process). 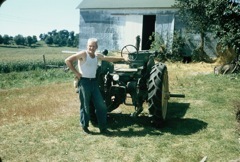 I know we owned all the machinery required for this operation because I played on it as it sat idle the machine shed. When I was little, I spent hours on end studying these machines and even though they were relatively simple they still had conveyor belts, gears, chains, knot tie-ers and other gismos to figure out. I would sit on them and pretend they were all manner of airplane or space ship. I would pull on the levers and press the pedals and work the other controls - I had them all worked out for flying and landing. Hey, this was way before TV and the alternative was playing school with my sister - she was always the teacher. I don't remember a time when we actually used this equipment. My first memories of silo filling are after we started to contract with a neighbor to fill our silo. 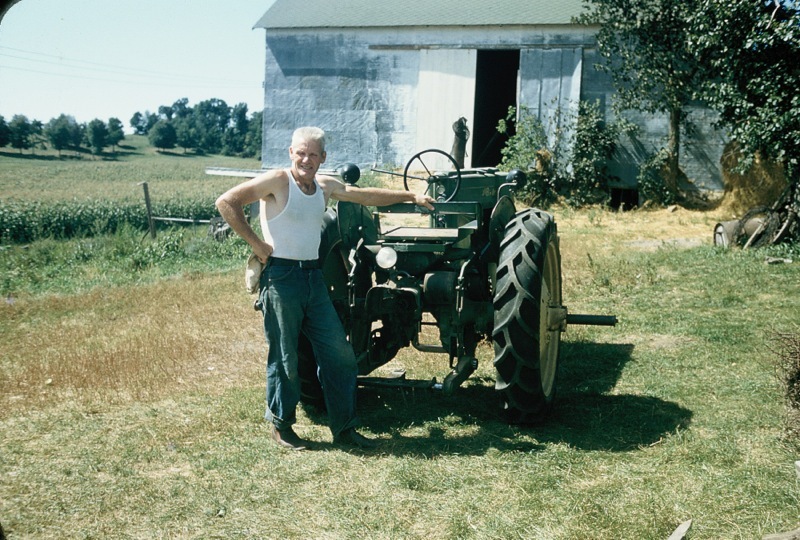 Melvin Klawitter owned all the modern equipment (field chopper, wagons, blower and lots - it seemed to me - of Alis Chalmers tractors). Mom made lunch for the crew and the food was as good as the threshing parties. And I sometimes got to drive the tractors pulling the wagons to and from the fields. Please proceed to Phase I section to begin story of deconstruction/disassembly of this barn: [Click here to continue].